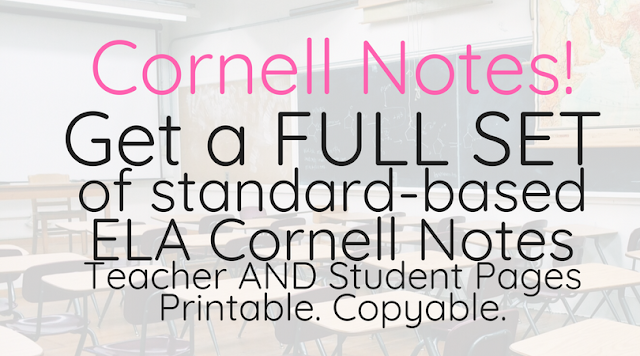 My Cornell Notes are NOW AVAILABLE for YOU! My Cornell Notes Series has been so unbelievably popular! 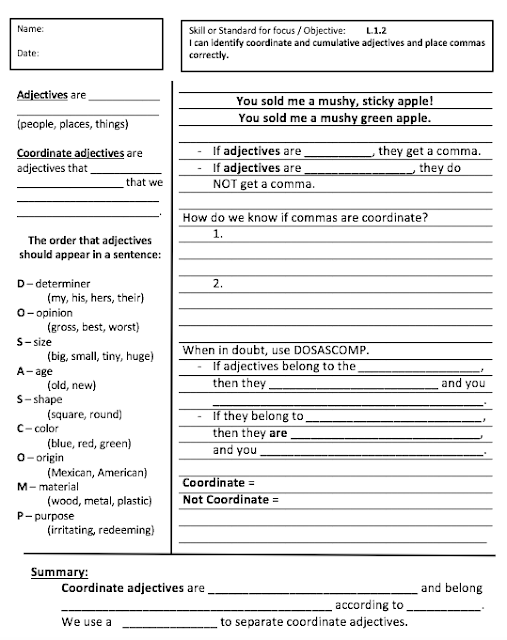 I hear from a lot of you every day asking for more samples of my Cornell Notes, and asking if I have a full set available for you to use. Until now, I didn't. Honestly, I hadn't considered creating a full reproducable set! 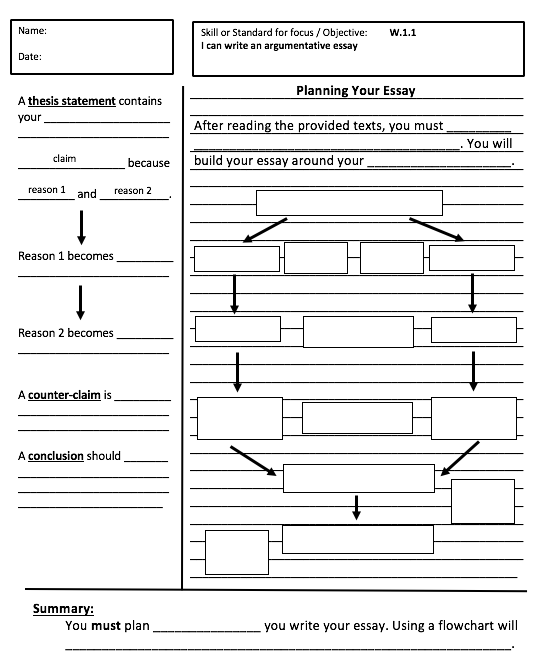 There is a one-page Cornell Notes page for every middle grades ELA standard that includes vocabluary, strategies, and examples including diagrams, flowcharts, and pictures. I have even included pages for writing informational and argumentative essays. Everything. An entire year's worth of notes. Already finished. The best part is that the differentiation is built right in! Each standard has a one-pager that contains the notes themselves, and then there is a second page that is identical except all of the key information is gone, and students have to fill in the blanks! 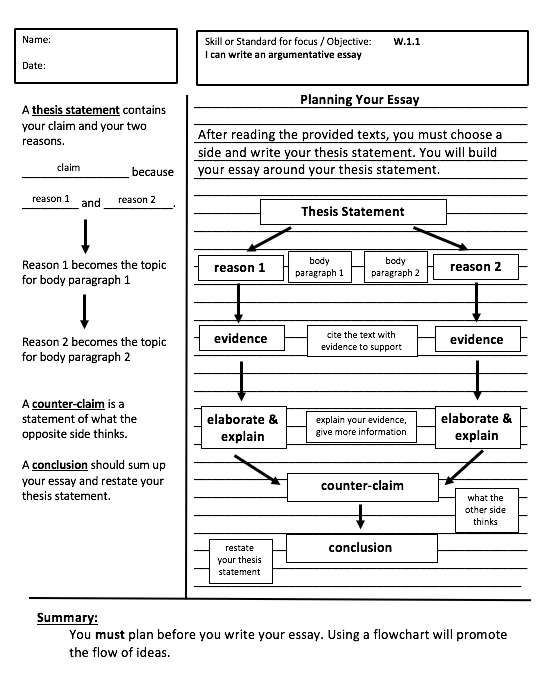 There is also a blank Cornell Notes page at the end, so you can differentiate like a seasoned pro! Students who struggle with writing, or ELL students who are new to the language can have the full page of notes - just give them a highligher and have them highlight the important/key information! 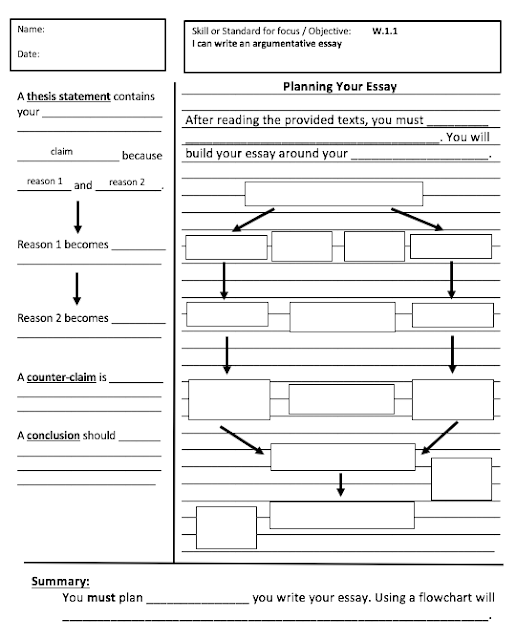 Students who can do some of the writing can use the fill-in-the-blank page, and students who can keep up and write the entire page can have a blank sheet! THREE different levels of differentiation happening at the same time in one classroom. Even a brand new teacher will look like a seasoned pro, and your students will benefit immensely! These Cornell Notes pages are typed and ready to print! You can photocopy them, share them with your colleagues, and use them in your classroom! This document is 55 pages long and covers the middle grades ELA standards including reading informational texts, reading literature, writing, and grammar. There are tons of strategies (RACE, CER, SWBST, TAP, DOSASCOMP to name a few! ), examples including sample poems and excerpts from plays, illustrations, flowcharts, diagrams, and pictures. This is available for purchase for $9.99. It is a PDF file. This purchase will be processed by PayPal. You can use a credit or debit card through PayPal. Please purchase through the Purchase Now link below. Once your purchase is processed, you will be redirected to the page where you will have access to the file containing the Cornell Notes. Do not close your browser until you are redirected to the access page! If for any reason you have technical diffiulties with the file, please email me with your full name and email address, and I will get to the bottom of it within 24 hours. Hey, I’m loving this system. I also found that interactive notebooks and I did not work well together. I know these notes are for each standard (I’m assuming common core?) but what grade level are they intended for. I’m teaching 8th grade ELA and want to be sure they are about the right level. Also are the files editable or simply a pdf? It is in common core ELA standards, which vary only slightly from grades 6-12. I teach 7th grade ELA, so I had middle grades in mind when I made it (6-8). It would be equally effective for high school, though! :) hope that helps! Hello! I am definitely interested, but I teach 5th &6th resource ELA and am concerned it may need to be modified even more. Is it possible to also get an editable copy? Thank you! This is amazing! Thank you! Sending email soon! WOW! You are fast as lightning. If you are thinking of buying this product, as a mom of four and a high school teacher, I could not recommend it higher! Hello, I'm interested in purchasing, but was wondering how many pages are devoted to each area? I'm only interested in the reading informational text and literature sections. We have separate reading and writing classes so I'm not really interested in the writing or grammar parts, just wondering is I will still get a lot out of this? Hi! This is mostly the reading standards for informational and literature. There are a few at the end for writing, but most of the pages are for reading. 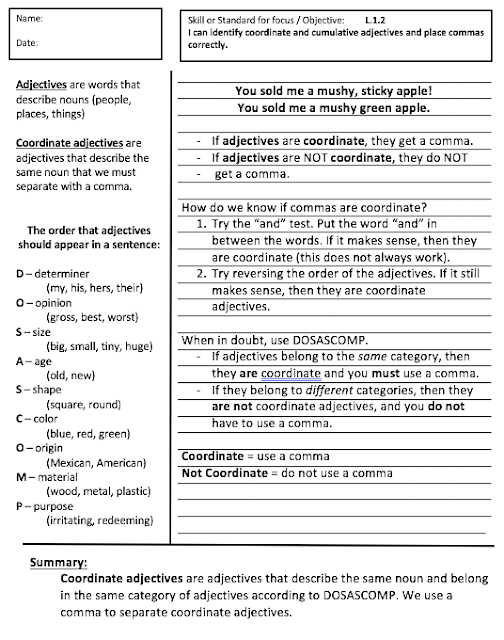 Some of the standards are divided into multiple sheets, for example, for informational text structures, there is a different sheet for chronological order, one for cause and effect, one for problem-solution, etc. Because some of the standards encompass multiple skills, there are separate sheets dedicated to each skill. I hope this answers your question! Hello! Do you have a sample page I could try before purchasing? I teach 5th grade and want to make sure this works with my classes. If so my email is mdavidson@villagecharter.org Thank you! I just purchased but would love the editable version in case I would need to modify. Thank you for your hard work on this! Does the card have to be a PayPal debit card. I like the potential for this product in my classroom, but I can't purchase it. I tried to purchase through PayPal with my bank card, but I couldn't get to the product after signing on to PayPal. Help! What am I doing wrong? Thank you for such a quick email response! Keep up the winderful work here - I've just discovered your blog and am so glad to have read! I teach in Texas and therefore use TEKS (Texas Essential Knowledge and Skills) instead of Common Core standards. Would you happen to have a set with TEKS alignment? Hi Rebecca! I am not familiar with TEKS, however, I imagine the standards are not that different than CC or LAFS (what we use in Florida). If you decide to purchase, I can email you the editable file, and you can change the standards to align with TEKS. :) kailysimpson@gmail.com just shoot me an email! That sounds great! I just purchased the product and sent you an email. Thank you! I have sent you an email, but thought I would post here also. I just purchased this product, but I don't know if you send it to my email of if I missed how to download it after purchasing. Can you please advise me of what to do to access the file? Is there a version that would work with 3rd graders? Thanks a ton! I just purchased your product and the file is amazing! I am so eager to try it with my students. Keep blogging and saving lives :D.